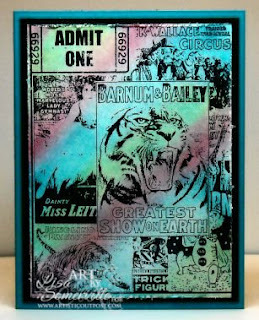 I just love the size of this image from the Artistic Outpost Vintage Circus - it fits perfectly on a 3-3/4" x 5" panel. Here I used the Opalite Color Infusion Technique to add color to the background - quick and easy! This card is perfect, I especially love the background of it, it's so vibrant! Oh Lisa this is just beautiful!!!!! I love the colors you have used. oooooh...aaaah! Super COOL! You always know what to do with whatever stamp there is!